Ridesharing is already a thriving means of transportation for Californians. Uber and Lyft, two of the paid carpooling industry giants, are everywhere on our roads, with their own passenger pickup areas now at LAX and other major airport hubs. A very important legal reality: Drivers for Uber and Lyft are responsible for knowing and obeying the laws of the road. When they fail to live up to their legal obligations and standards of care and passengers or pedestrians gets injured, they may be guilty of negligence. If you have been injured in an accident or incident with a Lyft or Uber vehicle, it’s important to know and understand your rights, including your right to file a lawsuit against the driver, the company, and even third parties that may be involved. 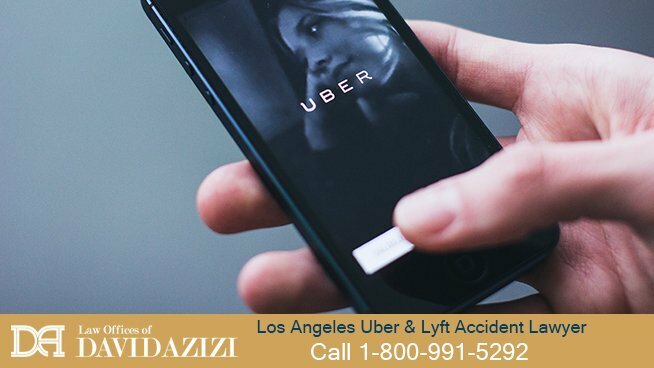 For immediate help and a free review of your important and time-sensitive case, call the Law Offices of David Azizi – a Lyft and Uber Accident Law Firm in Los Angeles – at 800-991-5292.
Who Is At Fault After an Uber Car Accident? An Uber / Lyft driver is a fault after a passenger or other driver is injured in a crash. An Uber / Lyft driver gets injured and another driver is at fault. More than one party may be at fault for injuries sustained while in an Uber / Lyft vehicle. Determining fault becomes an essential element in pursuing justice and fair financial compensation for injured victims. Simply put, when an accident occurs, and there is negligence involved, the amount of what you can financially recover is dependent on how much each party was at fault. That’s an important reason to get your case reviewed, because even if you think you were partially at fault, there may still be a sizeable amount to financially recover. All said and done, passengers are considered negligent free passengers and can pursue a claim against the at-fault driver. Negligence occurs when someone legally owes you a certain standard or duty of care, fails to live up to that standard, and you get harmed as a result. When this happens, you have legal grounds to seek justice and fair financial payment for your injuries, lost wages, and pain and suffering that was caused by the negligent act. Rideshare drivers must be held to the higher standard of driving they have signed up for. Many of these acts of negligence can be attributed to the driver and the company that contracts them. In some cases, a claim of wrongdoing and a demand for compensation can be brought against both the rideshare driver and company. After an accident involving an Uber or Lyft rideshare vehicle, injured victims should always focus on their health and physical wellbeing. Attend all scheduled doctor appointments — not doing so could jeopardize your claim of a serious injury — and keep accurate records. It’s common for many motorists to carry only the bare essentials of insurance coverage, reducing the opportunity for a financial recovery of damages when you’ve been in an accident. Uber accident insurance coverage works differently. The California vehicle code governing Transportation Network companies (Article 7, Section 5433) mandates a $1 million policy for Uber and Lyft drivers. Driver is offline & not working: During this period, should an accident occur, the insurance coverage is reduced only to what the driver carries for themselves. No additional Uber / Lyft policy is in place. Driver is waiting for a ride request: During this period, should a crash occur, Uber and Lyft have $50,000 in coverage limit per person, $100,000 for injured victims per accident, and $25,000 for property damage. Because insurance policies vary with these periods mentioned above, it’s always a strong move to consult with an Uber & Lyft accident team that is well versed in navigating through the complex world of insurance and law. For nearly 20 years, The Law Offices of David Azizi have stood up for victims of car collisions and truck accidents. 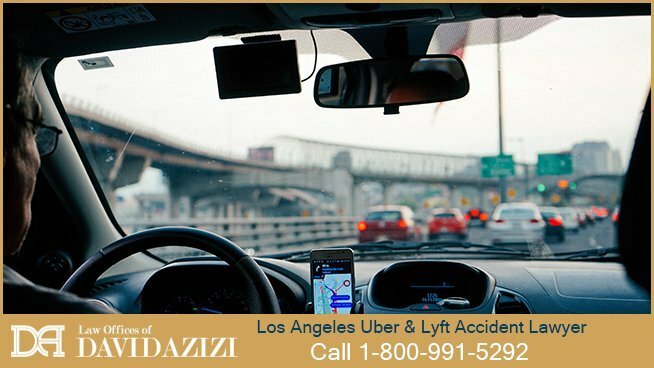 A personal injury attorney with Los Angeles roots, David and the Uber and Lyft accident team offer a free case review to go over the important details of your injury claim. We’ll investigate the insurance coverage involved in the Uber or Lyft accident, and will give you a best case scenario of what you can anticipate with your case. Your next move involves sharing your important story. Timing is always an important aspect to keep in mind, not only for the California statute of limitations which sets a deadline for filing a lawsuit, but because evidence begins to disappear and stories change as time progresses. If you are ready to begin, chat now or call us at 800-991-5292 and begin the journey toward justice and the financial compensation you and your family deserve.